You hand out too much candy!, says Mel. I have been giving 2 pieces per trick-or-treater; generally the size of a gobstopper and a sucker. Or, a single “fun-sized” chocolate bar. No, I moan… I simply haven’t bought enough! The $35 I spent left us a full 45 minutes or more short. This is what happens when you live across the street from the church that hosts the annual party given by the local community association. Our house is first in the line of sight to exiting party-goers. And we live in a neighborhood where people arrive by the carload from other, less fortunate, parts of town. We get slammed. Seriously, it’s not uncommon to have as many as 20 kids in line. 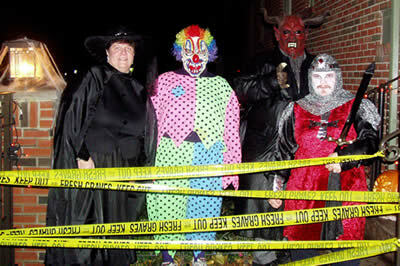 If we decided not to hand out candy to kids who aren’t wearing costumes that would alleviate about 25% of the demand. But that would just be mean. No costume = no treats. Otherwise, I’m all for them taking 1 or 2 pieces of whatever I’ve got. Oh, and that’s an awesome jack-o-lantern! Who carved it? 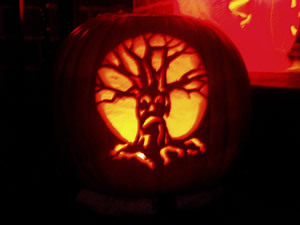 I carved the gnarly oak pumpkin. Took me a long time… but turned out nicer than any of the others we did.